The Sue Adler Team’s business has grown organically because of this mindset, and for the third year in a row. 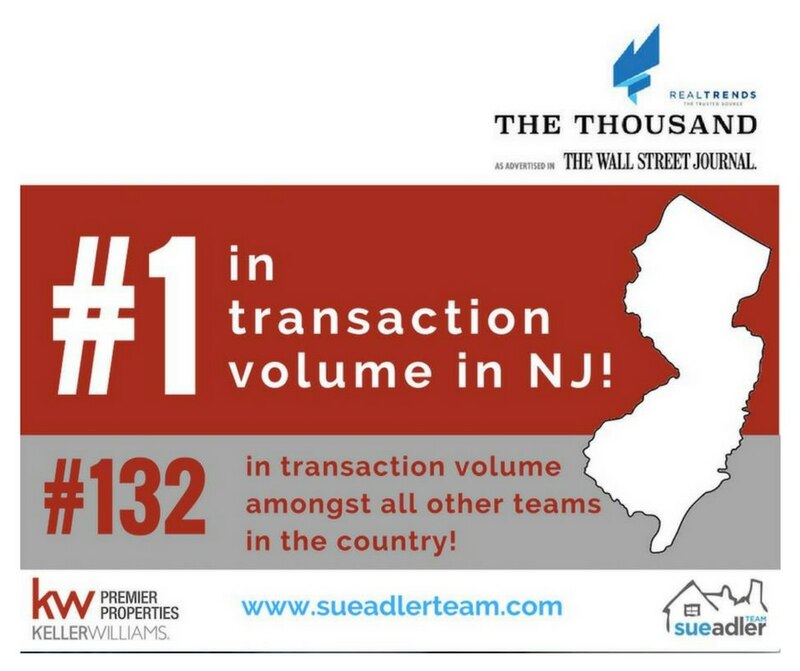 They have achieved the #1 spot on Wall Street Journal /Real Trends list of Top Teams in New Jersey by transactional volume. They have outperformed all Real Estate Teams in New Jersey now for three years in a row! As we all know, when we have an extraordinary consumer experience, we shout that company’s name from the rooftops – and that is the most rewarding way to grow any business. That in a nutshell has been the hallmark of the success of the Sue Adler Team – work from the heart and advise clients as you would a close friend, which means you tell them the truth even if it isn’t something the client doesn’t want to hear. Be their champion, their advocate – do whatever it takes for them and never give up, and everything else falls into place. “If you are thinking about moving but holding yourself back, what are your pain points/fears? Is it getting the house ready but not wanting to deal with it? Getting a certain price but not sure who to trust with pricing? Not knowing where you would move? Not understanding the market timing? (it may not be what you think!) or maybe you worry about making good decisions and who to trust? We get it! Because we are consumers too, and are the same way when looking for a professional in a field that we don’t have knowledge in!”, says Adler. Call 973-936-9129 and we can walk you through all of it so that you feel confident in making an educated decision. The time we spend together is YOUR consultation. It’s not a sales pitch.